iTunes can play the digital audio files that you download from the Internet on your MacBook or obtain from other sources in the WAV, AAC, Apple Lossless, AIFF, MP2, and MP3 file formats. Enjoying a digital audio file is just slightly more complicated than playing a CD. After downloading or saving your audio files to your MacBook, open the Finder and navigate to the stored files. Then simply drag the music files from the Finder to the Music entry in the iTunes Source list. The added files appear in the Music section of your iTunes Library. Think of the Library as a master list of your digital media. To view the Music Library, select the Music entry in the left column of the iTunes player. You can also drag a song file from a Finder window and drop it on the iTunes icon on the Dock, which adds the song to your Music Library. To play a song, just double-click it in the Music list. Alternatively, you can use the playback controls. Library: This section includes Music, Movies, TV Shows, Podcasts, Books, iTunes U, Apps, Ringtones, iPod Games, and Radio. Devices: If an iPod, iPhone, or iPad is connected, it appears in the list. Audio CD: A standard audio CD. Store: Buy from the iTunes Store. Genius: Why not let iTunes match new music to your tastes? Click the Genius heading and then click the Turn On Genius button to allow iTunes to automatically create playlists from songs in your iTunes Music Library. You can also allow Genius to recommend music, movies, and TV shows based on the titles you already have in your iTunes Library. Shared: If another Mac or PC on your local network is running iTunes and is set to share part or all of its Library, you can connect to the other computer for your music. Home Sharing: You can turn on Home Sharing to share your Mac’s media library across your wireless network with up to five other computers, as well as iPhone, iPad and iPhone touch devices. Playlists: Think of playlists as folders you use to organize your music. If some of the songs that you’re adding don’t display anything for the title, album, or artist information, don’t panic; most MP3 files have embedded data that iTunes can read. If a song doesn’t include any data, you can always add the information to these fields manually. After you add a few dozen songs to iTunes, viewing the Library can become a task. To help out, iTunes can display your Library in another format, too: namely, browsing mode. To view the Library in browsing mode, click the View menu and click the Show Browser item, or press the cmd+B keyboard shortcut. 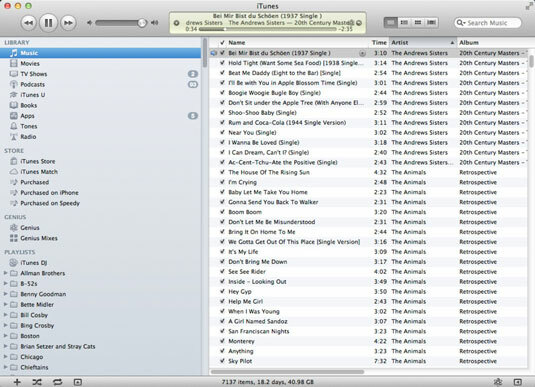 Selecting an artist from the Artist list causes iTunes to display that artist’s albums in the Album list. Select an album from the Album list, and iTunes displays that album’s songs in the bottom section of the Browse window. You can also switch between sort fields for the Browse window from the View→Column Browser menu item. After your collection of audio files grows large, you might have trouble locating that Swedish remix version of “I’m Your Boogie Man.” To help you out, iTunes has a built-in Search function. To find a song, type some text in the search field of the main iTunes window. While you type, iTunes tries to find a selection that matches your search text. The search is quite thorough, showing any matching text from the artist, album, song title, and genre fields in the results. For example, if you type electronic in the field, iTunes might return results for the band named Electronic or other tunes that you classified as electronic in the Genre field. Click the magnifying glass at the left side of the search field to restrict the search to Artists, Albums, Composers, and Songs. After you spend some time playing songs with iTunes, you might decide that you didn’t really want to add 40 different versions of “Louie Louie” to your Library. To remove a song from the Library, click the song to select it and then press Delete. You can also remove a song from the Library by dragging it to the Trash in your Dock. iTunes displays your videos as thumbnails, as a list, or in Cover Flow view. Music videos appear as a smart playlist. Double-click a video thumbnail or an entry in the list. Drag a QuickTime–compatible video clip from the Finder window to the iTunes window. Video files that can be viewed by using QuickTime typically have file extensions of .mov, .mv4, or .mp4. iTunes plays video in the box below the Source list, in the iTunes window, in a separate window, or in full-screen mode, depending on the settings you choose from the View→Video Playback menu item. In full-screen mode, move your cursor to display a control strip at the bottom of the screen. The control strip sports a slider bar that you can drag to move through the video, a volume control, and Play/Pause and Fast Forward/Reverse buttons.